On Saturday, Sale made the long cross-country journey to Herefordshire to take on Luctonians in their final game of the season. 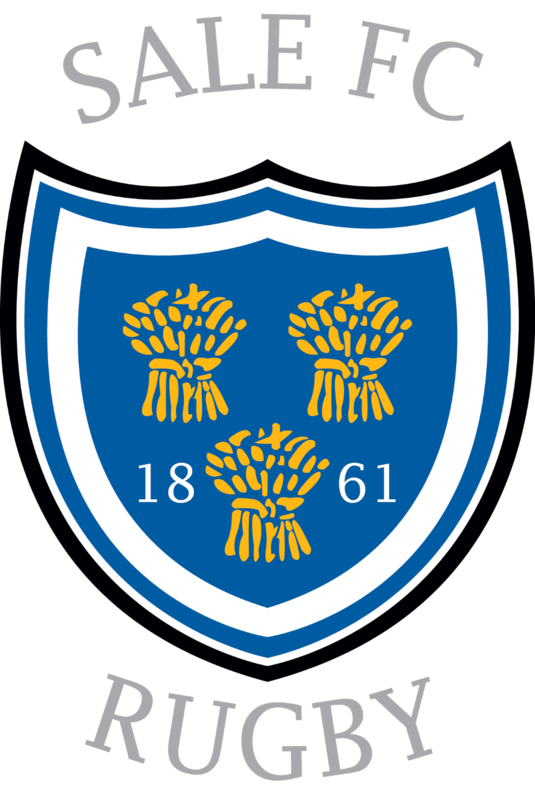 The blue and whites had already confirmed promotion two weeks ago but, for Luctonians, their goal was clear – they needed a bonus point win to avoid relegation and in hopeful anticipation, Mortimer Park was packed to the rafters. Sale travelled down to the East Midlands on Saturday afternoon to play Leicester Lions, knowing that a win would secure them the Championship and promotion to the third tier of English rugby. Cheered on by a sizeable travelling support, the game kicked off in wet conditions and, with less than a minute on the clock, the home side took the lead as they gained possession halfway inside Sale’s half before throwing the ball wide for the scrum half to scamper in. Any sign of nerves were quickly dispelled though as the blue and whites began to dominate possession and territory. After a couple of reset 5-metre scrums, they levelled the scores as captain, Andy Hughes, crashed over the line. On 23 minutes, Chris Johnson kicked a fine penalty to put the visitors into the lead and his clever kicking game continued to keep the hosts pinned back inside their own half. With a couple of minutes of the first half left, Chris Johnson arrowed a majestic drop goal between the posts to extend the lead and, as the clock ticked past 40 minutes, Sale’s forwards attacked the try line again with the defence unable to stop Tom Ailes diving over. The hosts came out for the second half with renewed vigour and quickly had the title hopefuls on the back foot and camped on their own try line for an extended period. It seemed inevitable that the Lions would get back in the game, especially when Neil Briggs and Dan Birchall were shown yellow cards within the space of five minutes, but incredibly the 13 men survived, putting their bodies on the line time after time to deny the home side. Having resisted for more than 25 minutes, the blue and whites finally relieved the pressure and took play to the other end of the field where replacement prop, Simon Griffiths, burrowed over for a third try from close range, Chris Johnson adding the extras. This seemed to take the fight out of the home side and, with confidence seeping back into the table toppers, they struck twice late on to put the icing on the cake – Chris Taylor scoring the bonus point try following good work from Joe Kelly and Matt Lawrence adding a fifth after a beautifully-judged cross field kick from Matt Bradley. As the final whistle blew, coaches, players and supporters congregated as one on the TMDP Park turf to celebrate an historic win for the team (another great example of #onesalefc). With 26 wins from their 29 games, including 22 wins on the trot, Sale were confirmed as Champions with one game to play, this despite the superb recent form of their closest challengers, Sedgley Park. Director of Rugby, Jonathan Keep and coach, Tote Howcroft deserve enormous credit for keeping the team focused after missing out on promotion so narrowly last year and leading them to new heights this term. As for the players, week in week out they have been immense, producing moments of scintillating rugby, but also a fortitude in defence which has seen them concede an average of less than 12 points a game – a quite remarkable effort. Huge congratulations to each and every one of them from all at the club. This weekend Sale FC Rugby have the biggest weekend since the days of Sale Sharks. When the Sale Sharks departed for Stockport, not much was left apart from the physical property. The club has been rebuilt from the ground up, and the minis and juniors section has exploded. There have been hundreds of volunteers over the years who have contributed to where we are now, manning the gates, raising the flag, cleaning, coaching or raising money. Without these people, the club would have ceased to exist. For the Junior section, I am proud to be one of three people who have been Chair of the Minis and Juniors. My predecessor Mike Boyle left me with the solid foundation of a M&J section. For three -years I was the caretaker of this section, before handing the baton to Scott Bambrick. Scott has taken what we built and turned it into an unrecognisable force in Cheshire, with a hard-working committee, a community coach and a thriving social scene. This section has become the mainstay of the club, leading Chris Johnson to say, they’re worth 10 points to us when we play at home. They’ve earned the title “The 16thMan”. Next weekend four of the junior teams compete for silverware. These four teams along with all the other M&J age groups are part of something that we should all be proud of. Every child who comes to us, has a place. Every child has something to give to the club. Whether they are a prop or a winger, a flag waver on a Saturday at Heywood Rd or a future coach. Our ambition for these children, is they have a club for life, regardless of whether they play semi-professional rugby, social rugby, volunteer or just turn up and watch. In the senior section, Richard Trickey essentially built a club from scratch after the Sharks left and Jonathan Keep (first as player coach then as Director of Rugby) has kept that building work going. His coaching team has brought us from Level 6 in 2013 to the brink of National 1 in 2018. With only two loses this season so far, one of those by 2 points, we have a stunning defensive record and have won every home game and 21 games in a row. In fact, the last time we lost at home in the league was to Caldy in December 2016. Jonathan and Anthony (Tote) Howcroft have taken a team from the brink of relegation two years ago to the edge of promotion tomorrow. They have developed a philosophy and set standards that goes beyond the sum of its parts to create a team who can win even when they are seemingly down and out. This has been a fantastic year and win lose or draw, we are all proud of every single player from the 5-year old to the 35-year old who will show up to play this weekend and next. This Saturday 20 members of the club will take the pitch and try to win the league, but, they are not alone, a further 60 M&J members will also be taking to pitches all over the North West next Sunday attempting to also win trophies. We haven’t yet arrived at where we want to be, but we are getting closer. Sale FC Rugby TV are now a video explaining how much it means to the players to have the Minis and Juniors down to support them. Chris Mayor, Chris Johnson, Jack Moorhouse, Matt Bradley, Neil Briggs, Jonty Rawcliffe, Tom Ailes and Captain Andy Hughes all give us a taste of what it’s like for them to run out in front of a big crowd and the guard of honour.